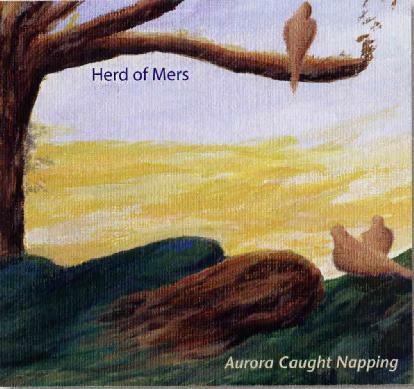 Herd of Mers - "Aurora Caught Napping"
Herd of Mers is the duo of Karen and John Orsi. Karen is the primary composer playing the guitar and singing. Her husband adds the percussion and other stuff. A wide mixture of really cool and original music on this CD. I was really impressed. Very emotional stuff. While Karen will not blow you away with her singing, she has the passion and emotion that is tightly tied into her guitar playing. The CD features 8 tracks in 28 minutes or so. It is hard to describe these emotional tracks. This is very personal music and I recommended it. Cool stuff.